County Wexford is located in the south-east corner of Ireland. It is bounded by the sea on two sides: on the south by the Atlantic Ocean and on the east by the Irish Sea. The River Barrow forms its western boundary. The Blackstairs Mountains form part of the boundary to the north, as do the southern edges of the Wicklow Mountains. The adjoining counties are Waterford, Kilkenny, Carlow and Wicklow. Ballyteigue Burrow, located near Duncormick, is one the finest protected sand dune systems in Ireland. It is rich in wildflowers, wildlife and butterflies. This 9 km coastal stretch, by the golden sands of Ballyteigue Bay, is a protected nature reserve and has spectacular scenery. The Hook Peninsula is noted for its many beaches and spectacular scenery. 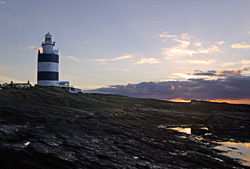 It features the medieval Hook Head lighthouse and the historic townland of Loftus Hall. There are some fine beaches at Courtown, Curracloe, and Duncannon.